Last week I talked about Dieter Helm’s book, where he portrayed a future in which oil companies are going broke and fossil fuel prices are collapsing due to their practically infinite supply (via fracking and horizontal drilling). Growing awareness of climate change has led to strong public pressure to reduce our carbon footprints and we are experiencing major shifts in how we source and use energy. This includes the growing conversion to electric power. The energy industry was (and is still) structured to accommodate the now-outdated perception that energy supply is finite and shrinking and electrical distribution continues to rely on archaic structures. Helm presents a rosy future for the US because we can adapt to this post-peak-oil reality. But his prediction does not factor in our election of President Trump, who is bent on returning us to the yester-world in terms of our treatment of the physical environment. As I mentioned in last week’s blog, I agree with some of Helm’s observations and disagree with others. I do feel, however, that it is easy to make predictions about a far future that many of us will not live to see (nor will we be held accountable for our predictions). Helm’s book suffers from that sort of glib certainty and I am aware that I have to some extent shared in the same practice throughout the five years I have been writing this blog. The first term in this equation refers to Energy Intensity – how much energy we need to generate a unit of GDP (Gross Domestic Product, used here as an Affluence metric). The second term represents the fraction of the total energy that is being generated from fossil fuels. The last term specifies the kind of fossil fuel that is being used (coal, natural gas or oil). The actual decomposition of global CO2 emissions is shown in Figure 2, which clearly demonstrates that for at least the last decade, Affluence has been the dominant contributor to emissions. What I referred to in that blog as Figure 2 I am reposting here as Figure 1. In past blogs I referred to the various indicators in the identity in global terms. Here, and in the next few blogs I will instead cite individual countries. There are two main reasons for doing so. First, our global system is made up of sovereign countries, each of which can (for the most part) enforce actions only within its own borders. The second reason is that once I focus on individual countries I can emphasize those that are more/less successful at transitioning their energy away from carbon-based sources. Table 1 includes population and GDP/Capita in current US$ for 12 countries. As Figure 1 shows, these are the two main indicators that drive carbon dioxide emissions. The population information came from the United Nations population review and the GDP/Capita came from the World Bank data case. The sum total of the current population of the 10 most populous countries amounts to more than half of the global total so it is a fair indicator of the whole number. I have added Ethiopia and the Democratic Republic of Congo because the UN is projecting that given their current growth rates they will be among the 10 most populous countries by 2050. According to World Bank classification, this table includes one high-income (the US), three low-income (Bangladesh, Ethiopia, and DR Congo), four lower-middle income (India, Indonesia, Pakistan, and Nigeria) and four upper-middle income economies (China, Brazil, Russia, and Mexico). In other words, it represents the full range of global income distribution. 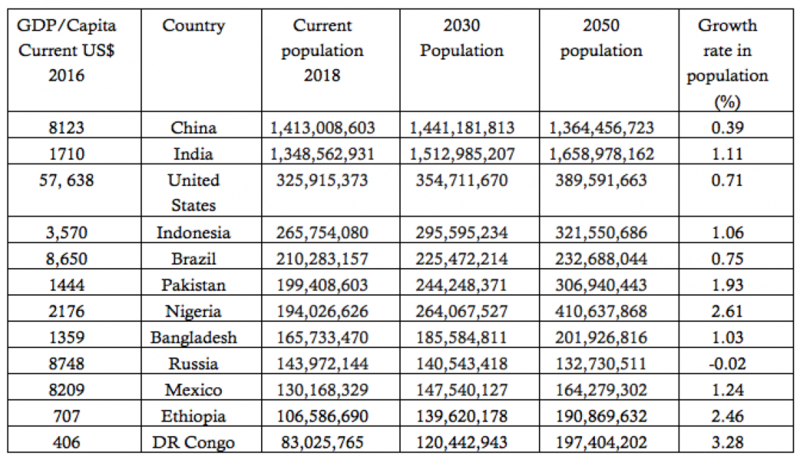 The table includes each of the twelve countries’ current GDP/Capita, growth rate, and population as well as their projected populations for 2030 and 2050. Next week I will focus on trends in primary energy use, emphasizing alternative energy and the resulting change in carbon footprints that these newly diversified economies generate. I will follow it with a compilation of electricity use and the drivers being used to collect the electricity. This entry was posted in Anthropocene, Anthropogenic, Climate Change, Sustainability and tagged accountability, Adaptation, alternative energy, Anthropocene, Anthropogenic, Bangladesh, Brazil, Carbon, carbon dioxide, Carbon Footprint, China, Clean Energy, Climate Change, Climate Change Denial, Climate Change Deniers, Climate Skeptics, CO2 emissions, Congo, Dieter Helm, Distribution, Donald Trump, Economics, electric, electric car, Electricity, Emissions, Energy, energy industry, energy transition, Environment, Ethiopia, Fossil Fuels, fracking, GDP, GDP/capita, Global, Global Population, Global Warming, greenhouse gas, horizontal drilling, identity, Income, income distribution, India, Indonesia, IPAT, IPCC, Local, marker, Mexico, Mitigation, Nigeria, Pakistan, peak oil, Population, Power, Power Plants, primary energy source, Romney, Russia, Science, Solar Energy, sovereign, Sustainability, Technology, Trump, UN, US, World Bank, World Population. Bookmark the permalink. Being a part of the world, we all have the responsibility to protect the planet. We can do something minimal that can make a significant change to the environment. For example, do not spend much time taking a shower, we are wasting gallons of water while taking a shower. Another way to save energy is to turn off power when we are not using it. Often people nowadays like to left their computer and television when they were out of their houses. Also, we can replace the light bulb with an energy saving light bulbs. All these methods are used to save the world, please take a step and give your children and grandson a better place to live. Driving is nowadays part of our daily life, and studies show that 1 gallon of gas produces 20 pounds of c02. On average, a car emits about six-tons of Co2 / year, and we all know the effects of greenhouse gases in the atmosphere that blocks the Radiation which contributes to worm the temperature of the atmosphere then Global warming. Leave your car at home is a naïve solution, but If we can stay off the road just two days a week; We can reduce greenhouse gas emissions by an average of 1,590 pounds (721 kilograms) per year. According to US EPA, the United States Environmental Protection Agency Combine your errands — hit the post office, grocery store and shoe repair place in one trip. It will save you gas and time. Walk or ride your bike to work, school and anywhere you can. You can reduce greenhouse gases while burning some calories and improving your health. If you can’t walk or ride, use public transit, even carpooling is an option. Saving at least two days of driving will help us have a better environment for the future generation. Climate has a considerable influence on the way we live. For example, it affects the crops we can grow and the diseases we might encounter in particular locations. It also determines the physical infrastructure we need to build to survive comfortably in the face of extremes of heat, cold, drought and flood. I’m proposing a plan to recycle all plastic materials or and a plastic recovery program that can help companies use plastic as a raw material. According to a BBC report. In the Pacific Ocean halfway between California and Hawaii lies what’s become known as the Great Pacific Garbage Patch, a massive jumble of fishing nets, bottles, bags, and other plastic items as well as tiny bits of plastic debris. “It’s a vast plastic soup,” says Kahi Pacarro, executive director of Honolulu-based Sustainable Coastlines Hawaii. We’ve known about the existence of the patch since the mid-1980s but weren’t quite sure about its size until a study published last March showed that it holds at least 79,000 tons of plastic and covers an area three times the size of France. We can reduce the used of plastic in the ocean by putting a place a program to utilize plastic waste as a resource to create other materials. There are companies like BIONIC YARN and UNIQLO that are working on this program to recover plastic from the ocean and turning them into raw material for their garments. However, we need worldwide support to increase the impact of a program that can potentially save our environment. Shut off electrical equipment in the when you leave work. Set your refrigerator temperature at 36 to 38 and your freezer at 0-5. When using an oven, minimize door open while it is in use; it reduces oven temperature by 25-30 every time you open the door. Use compact fluorescents light bulbs to save money and energy. Plants trees to shade your house. Keep your thermostat higher in summer and winter when you’re away. Climate change is past the point of a prediction, it has now reached the point of a definite threat. Part of solving any problem is raising awareness, I feel that not only do we have the power to change the way we act individually but we also have the opportunity to influence others through media. I am a TV and Film major and feel that one major benefit of that is that I have resources to educate and inform others on what we can do to help the planet without straining ourselves so much. Most people have the mentality that combating climate change is a very complicated process, it’s really more of a lot of people doing a small part to make a big change. I’d like to use media (i.e. Documentaries and Streaming outlets) to inform other people on the best ways to combat issues such as climate change. There are many simple ways we can save the world, but we choose not to. If people were to cut down on the things they throw away by recycling and reusing natural resources, the world would be a better place. You can also save the world by building trees, this can have a huge impact by providing food and oxygen. Trees help save energy, cleans the air and it helps with climate change preventing Global warming. We have all over-used the planet, resulting in too much CO2 in the atmosphere which leads to Global Warming. So the climate needs fixing. Stated by our former president Barack Obama, “We are the first generation to feel the effect of climate change and the last generation who can do something about it”, and I agree, climate change may become irreversible if we do not act fast and on a big scale. We need to work together to build the support needed to build a community that together can make a difference in this crazy world. There are many ways in which we can slow down climate change. Gone are the days of wondering if it is actually happening when there is scientific proof of it. The first but hardest step would be to convince the climate deniers by any means possible. Explain to them what the excess and unnecessary consumption is doing to the world. Even though that may be difficult, for those of us who actually believe that it is happening we too need to make changes and not just talk about it. One of the biggest offenses I see are with people who don’t recycle, especially in the United States. During my time spent in Europe, there was rarely a plastic bag that was used at a supermarket if at all. If you didn’t come in with your own shopping bags, you’d walk out with you items in your hands. Most people would carry recyclable bags that were made out of canvas or stretchy material. Below is a link to the manuscript concerning the electoral method of county apportionment I mentioned in our conversation earlier today. I will also provide a link to my general profile on Medium with all of my articles. Thanks for the invitation to comment with the manuscript on your blog!